5 Ways To Secure Your Home Before Winter | Calgary Alarm Inc.
Statistically, while the summer months typically have the most burglaries, the winter months are also a very popular time of the year for break and enters because burglars know that many homeowners will be away for the holidays. 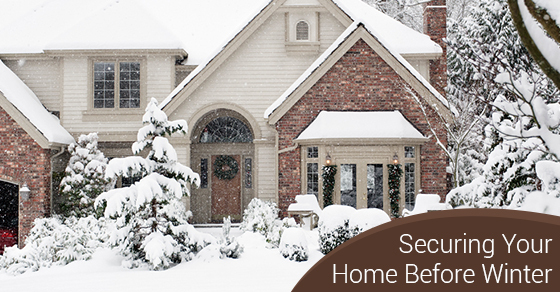 With that in mind, here are five ways to secure your home before winter. One of the best ways to make sure your home is as secure as possible is to prevent a potential burglary from happening in the first place. Studies show that homes are 2.9 less likely to be targeted if an alarm system is in place. Investing in a monitoring system will also make your home even more secure, as someone will be monitoring your home on a 24/7 basis for any potential threats. If a threat such as a burglary, fire or flood occurs, emergency services are immediately contacted and help will be on its way. Burglars are opportunistic, meaning that if your home looks like it’s lacking in security measures, you may become their next target. Putting two locks on your front doors—one being a deadbolt—signals that you take security seriously and likely have other security measures in place, all of which will deter a potential burglar. The security of your front door is very important, as the majority of break and enters occur through this point of entry. Therefore, it is also important to ensure that your door is as strong as possible to prevent it from being kicked in. Doors made of solid wood, a solid wood core or fiberglass are good choices. Before winter sets in, it is important to cut and trim down any tall trees and bushes. Burglars are more likely to target homes with tall trees and bushes because they can more easily conceal themselves. The winter months come with darker days and more opportunities for burglars to scout out your home without being detected. Ensure that your entryways are well lit. It is also a good idea to invest in timed lights for the interior of your home, especially if you typically get home after dark. Sheds tend to be used less in the winter months. If you’ve been relaxed about securing your sheds with locks, now is the time to do it. This is important for two reasons: it will send the message that you take security seriously (and therefore deter a potential burglar); it will also prevent a burglar from using your tools to gain entry into your home. Consider Calgary Alarms for your choice of alarms—we are one of the best security alarm monitoring companies in Canada. Contact us today for more.